Are you going to see the tree in Rockefeller Center? Marvel at the magnificent window displays? 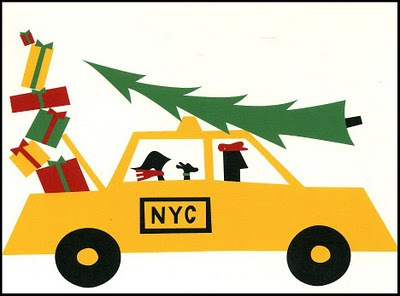 If you are making a holiday pilgrimage to NYC, here are some favorites from our bookshelf, to help generate excitement, find your way around, and preserve the experience. This Is New York by Miroslav Sasek. Absolutely brilliant and chock-full of amazing facts. Did you know that New York City has the world's largest police force and that a fire truck zooms off to answer a call every 6 seconds?! The illustrations make me want to plonk on a pork-pie hat, some plaid trousers (two inches too short) and start singin' show tunes. An absolute must. My New York by Kathy Jacobsen. An artist and her daughter move to New York City. To help her daughter get to know their new home town, the mother draws an illustrated map and tells her daughter that they can go anywhere she likes as long as she can figure out how to get them there. We have visited nearly every sight in the book and, thank to Kathy Jacobsen, have blown the kitty riding Bubbles, the black stallion with the lion saddle, on the Central Park carousel. Worth every penny. Next Stop Grand Central. Written and illustrated by the incredible Maira Kalman. What more can I say? An amazing collection of interesting facts and wry humor - clearly, Ms. Kalman shares my love of imagining the lives of fellow travelers. When you pull into the station, don't forget to visit the Whispering Gallery, or to look UP - other than the clock, the ceiling is my favorite bit. Eloise by Kay Thompson. What would New York be without The Plaza and it's most famous resident? Makes me want to order room service and ride the elevator up and down. And up and down. And up and down. Alphabet City by Stephen T. Johnson. I don't know for a fact that the city in Alphabet City is New York, but that's how I always imagine it. Phenomenal illustrations and a fun "spot the letter" game for kids who know their ABCs. A Walk In New York - a boy and his dad spend the day in the city. Of course, they get hot dogs from a vendor. Please have one with ketchup and mustard for me. New York's 50 Best Places To Take Children. Our copy is dogged eared, filled with notes, stained with ketchup and has been there and back many times over. Coving both iconic institutions (eg Museum of Natural History, Central Park) and off-the-beaten track finds (a magic shop where a personal show comes for free, or where to find the best milkshake and grilled cheese sandwich), this book is for you. The book is cleverly organized by attraction and cross referenced by neighborhood, so you can plan your exploration very efficiently. Indispensable. City Walks With Kids New York. Another great resource, this clever box of cards enables you to take only the relevant bits, so you don't need to lug around a whole book. Each one comes complete with neighborhood maps, listings of neighborhood attractions (complete with relevant details) and public transport info. We LOVE comments. Fire Away!